We were pretty disappointed when Respawn Entertainment CEO Vince Zampella shot down our dreams of seeing Titanfall 3 anytime soon following the release of the developer's surprise new free-to-play battle royale game Apex Legends. However, Zampella did say Respawn Entertainment is working on "more Titanfall for later in the year" and now, thanks to EA's quarterly earnings call (via Seeking Alpha), we have a slightly better idea what that could entail. Could Apex Legends be EA's answer to Fortnite? 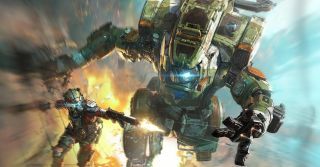 During the earnings call, EA CEO Andrew Wilson revealed the company is working on a new premium Titanfall game which is due to release in 2019. "The Respawn team has a strong plan for Apex Legends that will engage fans for a long time to come," Wilson explained during the earnings call. "As the live service evolves, Respawn also plans to launch a premium game this year that is a new twist on the Titanfall universe. More to come on that in the months ahead." "I don't have more to share on the particulars of what would come in for Titanfall," Wilson said later in the call. "What I would say is Respawn are a tremendously creative team, they always anticipated that Apex Legends would be a spectacular game in the Battle Royale genre and that they would use that as a ramp point to continue to innovate and deliver a truly creative take on what Titanfall is in a premium context later on the EA." So what does 'premium' actually mean? Well, we know that it means the new Titanfall game won't be free-to-play like Apex Legends – instead it will have an upfront cost.